Today’s task is to consolidate these lists into one and select the best 50 stocks for our portfolio. At a future date, we’ll add a 10th “Silver” list of stocks that have been highlighted on Twitter or in the public portfolios of selected investors. Downloading a CSV file from each of the screens and portfolios is straightforward in Stockopedia. My Access skills are pretty rusty – I haven’t used it in five years, and the version I now have (2007) is one I have never used at all. 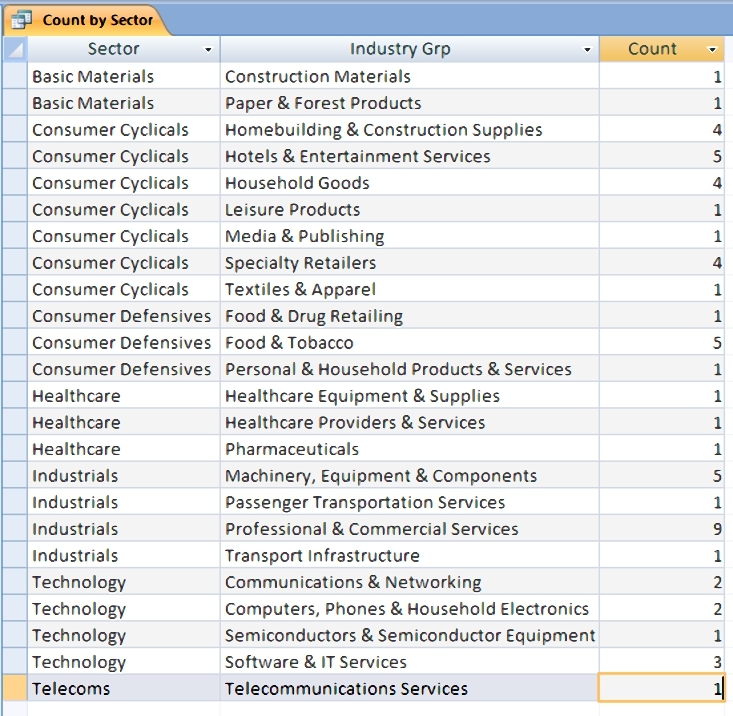 First I had to work out how to create append queries to add all the data into a master table. Using the ticker as an index key (and disallowing duplicates) meant that I got a list of uniques. I also had to change all the relevant field types to numeric, since everything imported as text. 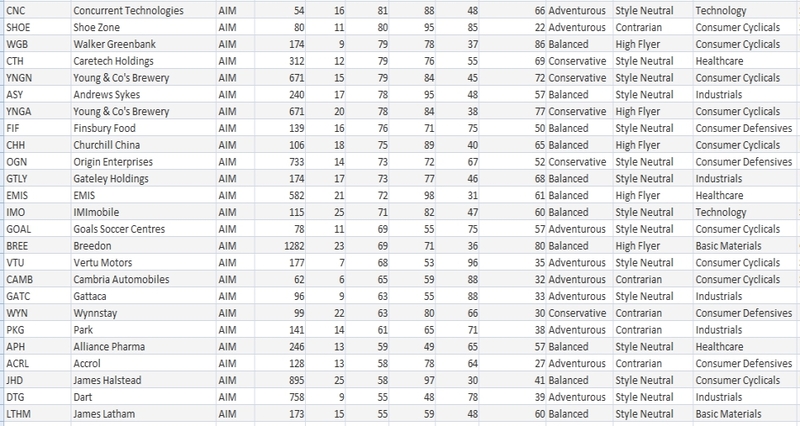 The master table has 148 records, so we need to start filtering some out. The first step was to exclude stocks with a market cap of less than £50M. That gets us down to 135 stocks. The second step was to exclude stocks that aren’t making a profit. This shows up as a missing PE ratio. And it gets us down to 123 stocks. 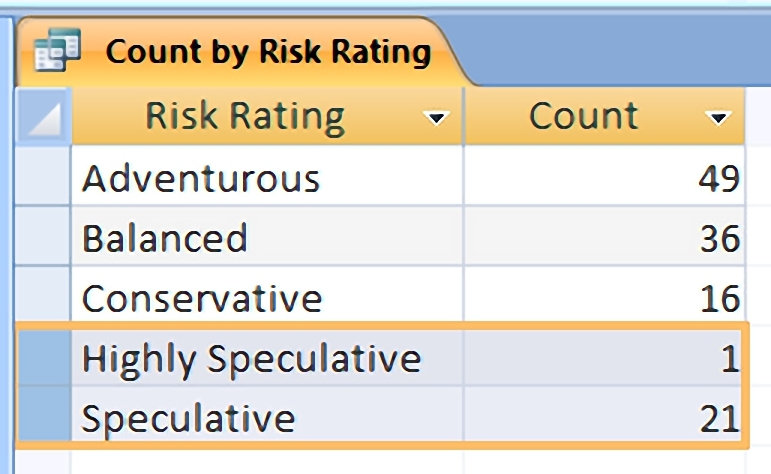 By sticking to the three lowest risk groups, we can eliminate another 22 stocks. That gets up down to101 stocks. 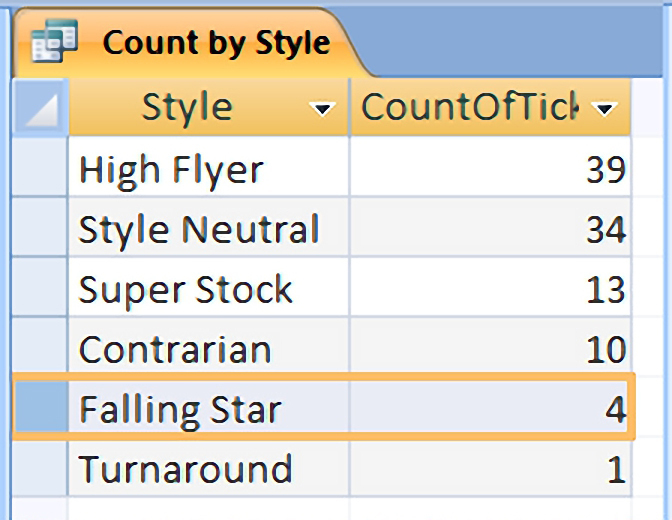 One is a negative style (Falling Star) – there are four in this group. So we can eliminate another 4 stocks, to get down to 97. Setting the minimum Stock Rank to 50 gets us down to 88 stocks. 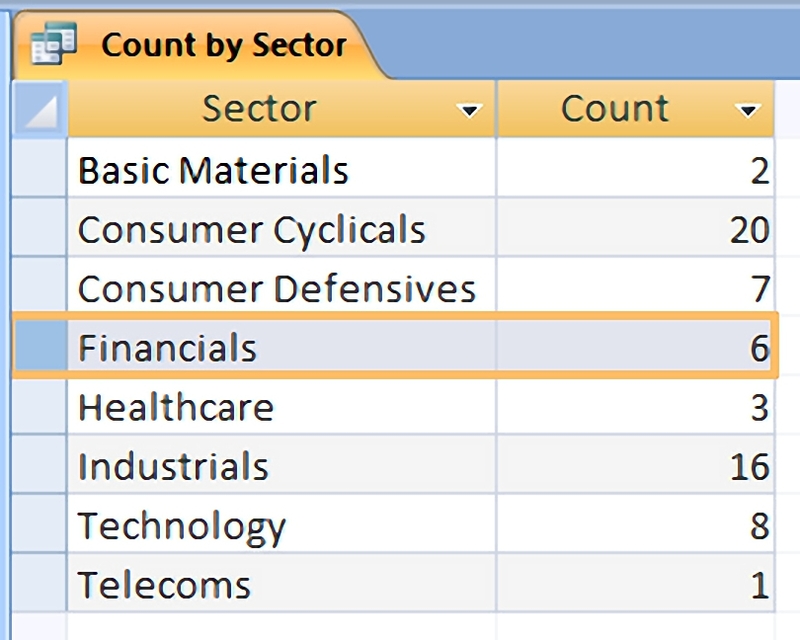 Setting the minimum Value Rank to 20 gets us down to 65 stocks. 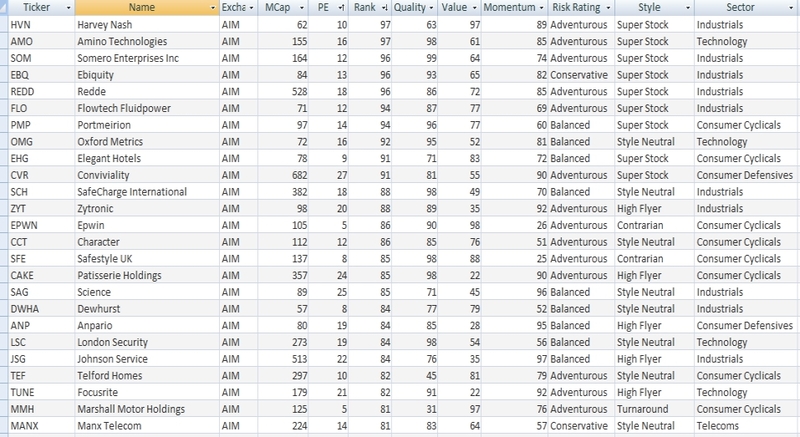 Setting the minimum Momentum Rank to 20 gets us down to 63 stocks. Setting the minimum Quality Rank to 20 keeps us at 63 stocks. Given where we are in the economic cycle, I’m not crazy about the large number of consumer cyclicals we’re left with, but that’s where we are. I’m going to have to trust that the Stockopedia algorithms know what they are doing, and will get me out of any stocks that start to deteriorate. If there are any red flags when I come to buy the stocks on the final list, I can use these stocks as reserves. So by setting the maximum PE to 27, we have our list of 50 stocks. That means putting the PE limit up to 28 to reinstate Conviviality to the list. So that’s it for today – time to start buying some stocks. We’ll review the numbers around a month after I finish building the portfolio. Yes – that got fixed during implementation. There were three duplicates I think, though one was sorted out earlier in the process.